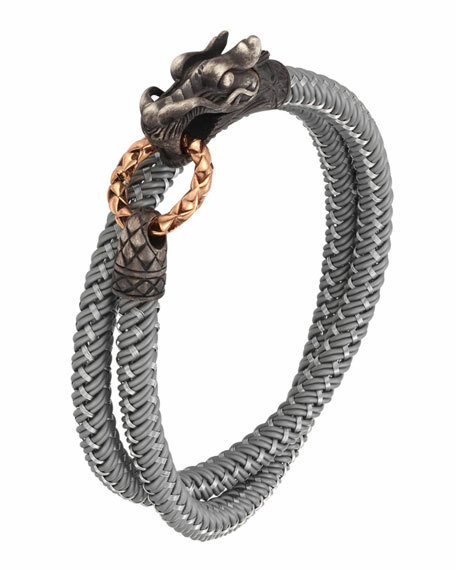 A mixed metal Naga dragon motif gives this John Hardy bracelet exotic elegance; the nylon cord construction adds utilitarian strength. Nylon cord woven with sterling silver wire. Naga dragon head clasps bronze ring. 16"L; wraps twice around the wrist. The Naga 'dragon' symbolizes everlasting love and prosperity. According to Balinese legend the naga dragon is known as the lover of the pearl and must dive from his volcano top home to the sea to visit his love, upon his return water cascades off his scales into the rice fields as a sign of prosperity. Rich textures and a play of contrast between sterling silver and 18-karat gold bring this legend to life. Designed with rich textures and a play of contrasts. Inspired by the island of Bali, John Hardy incorporated traditional Balinese jewelry-making techniques into his striking designs. The John Hardy collection, which is today under the guidance of Guy Bedarida, features earth-inspired handmade jewelry for men, women, and children. A company-wide focus on sustainability underscores its design motifs found in nature. For in-store inquiries, use sku #291473.